sorry for the long absence, but i was heavily occupied with data inquiries and thesis writing. Today i got some time to play around with a new wms-database i found. Don’t know if this site is already common knowledge around gis practitioners, but maybe someone doesn’t know it yet. Mapmatters provides an extensive database of OGC web map services and you could easily add all the data you want to QGIS via the “add wms-layer” button in the toolbar. 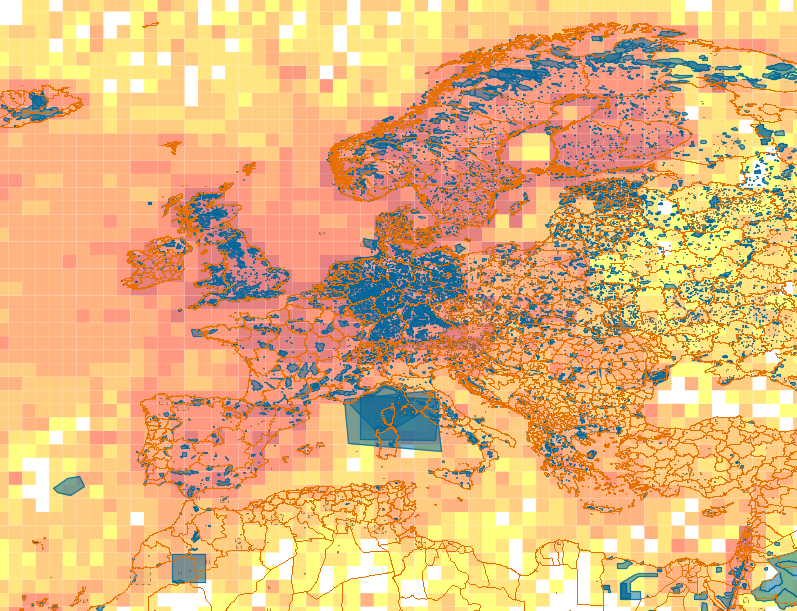 For example i wanted to explore the coverage of nature reserves and parks in Europe (From Protected Planet). I furthermore added national borders via the GAUL Service (Link) and compared the result with the density of published GBIF occurrence records. The density of GBIF occurrences is of course heavily biased by the number of participants per country. France, Germany, the UK and many Scandinavian countries have quite a history of natural collections and national-wide data surveys (such as breeding bird surveys). Furthermore the protected planet dataset is not always very accurate around the polygon borders and it includes all kind of different semi-protected areas such as landscape reserves, natural monuments as well as a lot of private property which is protected to some degree (private forests). This is why it seems as the whole of Germany is made up of protected areas.